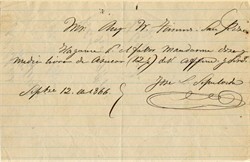 Historic document written in Spanish and signed by Jose L. Sepulveda dated September 12, 1866. Do me the favor of sending me twleve and a half pounds of sugar. Affectionately and at your service. Jos� Sepulveda � was born in 1815 at the San Gabriel Mission. With his brother, Juan Sepulveda, he was a grantee of Rancho Los Palos Verdes in 1846. He held various positions of authority in the Pueblo during the 1840s. 1842 � Manuel Dominguez & Jose Sepulveda � Juan Jose Sepulveda was the owner of Rancho Santa Ana (in Orange County). After Mexico's independence from Spain in 1821, the Mexican government secularized the missions and assumed control of the lands. It began distributing the land to Mexican citizens who applied for grants. Three large Spanish/Mexican grants made up the land that later became the Irvine Ranch: Rancho Santiago de Santa Ana, Rancho San Joaquin and Rancho Lomas de Santiago. 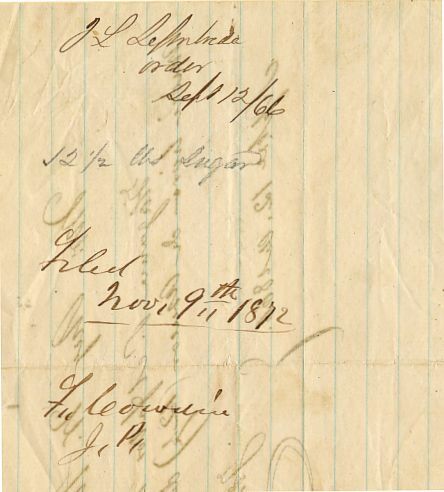 In 1864, Jose Sepulveda, owner of Rancho San Joaquin sold 50,000 acres (200 km�) to Benjamin and Thomas Flint, Llewellyn Bixby and James Irvine for $18,000 to resolve debts due to the Great Drought. In 1866, Irvine, Flint and Bixby acquired 47,000-acre (190 km�) Rancho Lomas de Santiago for $7,000. After the Mexican-American war the land of Rancho Santiago de Santa Ana fell prey to tangled titles. In 1868, the ranch was divided among four claimants as part of a lawsuit: Flint, Bixby and Irvine. The ranches were devoted to sheep grazing. However, in 1870, tenant farming was permitted. This beach was part of the 31,629 acre Palos Verdes Rancho, granted to Jose L. Sepulveda in 1827 and 1846. It was formerly part of the Spanish land concession of San Pedro to Dominguez in 1784. In 1852 German immigrant Augustus W. Timms obtained Sep�lveda's Landing on the mudflats (San Pedro). He built a wharf, added a warehouse, corral and other facilities to service shipping and the running of stages to Los Angeles. Timms was a pioneer in the development of the harbor and for over fifty years this area was known as Timms Point.